For me, eating this pie is like eating a slice of nostalgia. Even without the memories, it’s a chocolate-on-chocolate frozen delight. The recipe, titled Kraft Chocolate Thriller is from my grandma’s recipe collection, and is at least 30 years old, maybe much older than that. 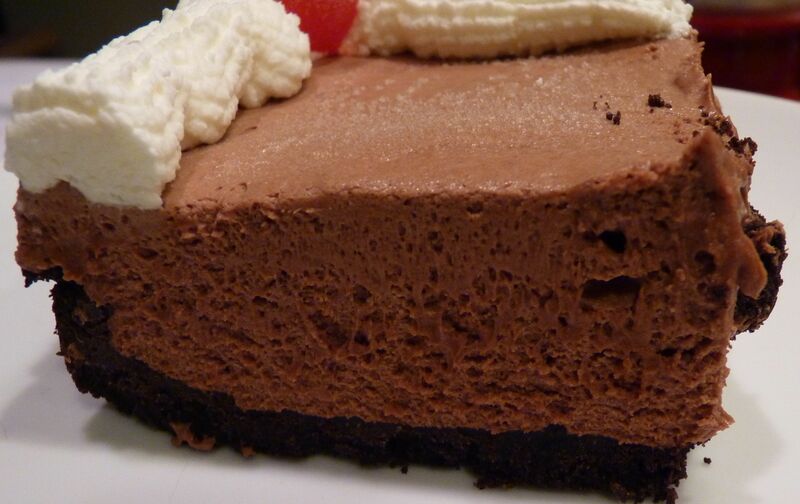 It may look like an ice cream pie, but one bite of the smooth, chocolate, cream-cheesy filling and you’ll forget about ice cream. You know what else is awesome about this pie, besides the taste? It’s frozen, so it’s a great make-ahead dessert. Some days, a “best served on the day it’s made” dessert just doesn’t fit into the schedule. The original recipe calls for raw eggs, but since most of us stay away from raw eggs due to food safety concerns, I used pasteurized-in-the-shell eggs. It was my first time using pasteurized eggs, and a few minutes after putting the whites in my mixer to whip, they looked very…unwhipped. I had an oh crap moment and wondered if this was going to work. I turned the mixer off and did a quick Google search, found this information, and turned the mixer back on. With a little bit of cream of tartar and a whole lot more whipping time, the whites turned out great. Whew. This is definitely a job for a stand mixer. 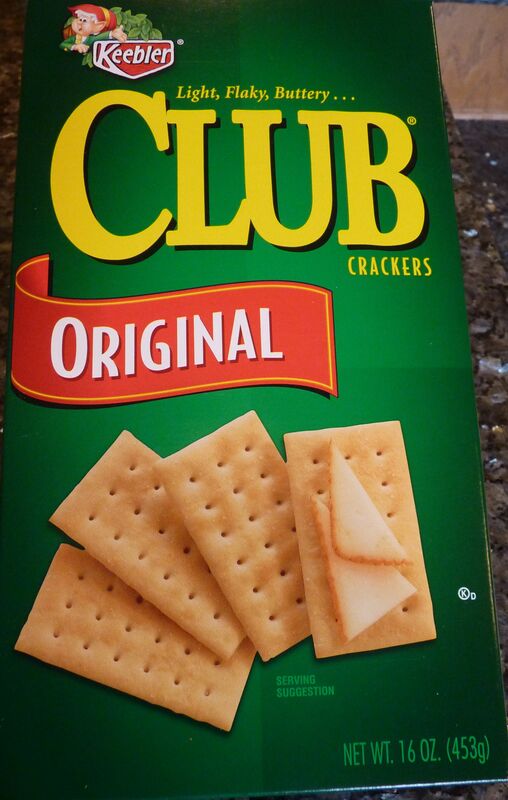 The crust uses Nabisco Famous Wafers, which are thin, crisp, chocolate cookies. If you can’t find them, use another thin, crisp, chocolate cookie. The Famous Wafers are really tasty, though, so take a look at your grocery store. To make crust: Preheat oven to 325° F. Mix cookie crumbs and melted butter and press onto the bottom of a 9-inch springform pan. Bake 10 minutes; remove from oven and cool on a wire rack. 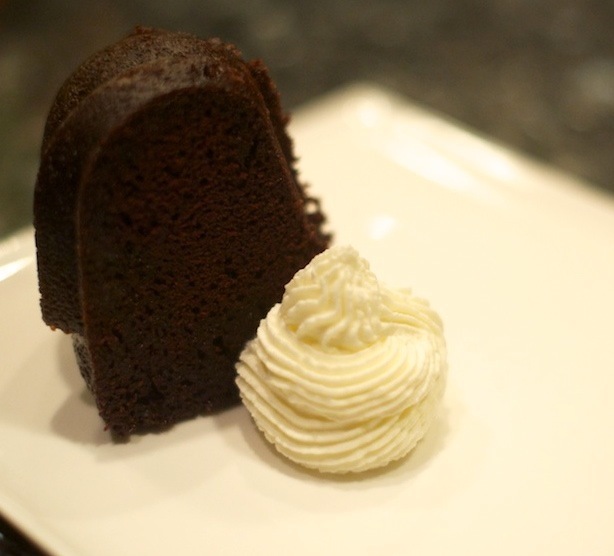 To make filling: In a large bowl, using a stand mixer or hand mixer, blend cream cheese with 1/4 cup sugar and vanilla. Blend in the egg yolks, then the melted and cooled chocolate and mix until thoroughly combined. Whip the egg whites, adding 1/4 teaspoon of cream of tartar after a couple of minutes and then gradually adding 1/2 cup sugar after a few more minutes; continue to whip until whites form soft peaks (see notes about whipping pasteurized egg whites). Fold the egg whites into the cream cheese mixture. Whip the cream and fold it into the filling mixture (reserve a little bit of whipped cream if you want to use it to decorate the pie). Scoop filling into cooled crust and smooth the top. Cover the pan with plastic or foil and freeze overnight. To serve: To soften a little before serving, put pie in the refrigerator for a couple of hours, or let it sit at room temperature for a short period. Timing Tips: I whipped the cream in my stand mixer first and then transferred it to another bowl so I could wash the mixer bowl and use to to whip the egg whites. While the egg whites were whipping, I melted the chocolate and used a hand mixer to combine the cream cheese, sugar, vanilla, egg yolks, and chocolate. This recipe and I go way back. I had some friends over for dinner recently and I knew that they’d remember this blast-from-the-past drink, which was good in the ’90s and is just as good in 2010. 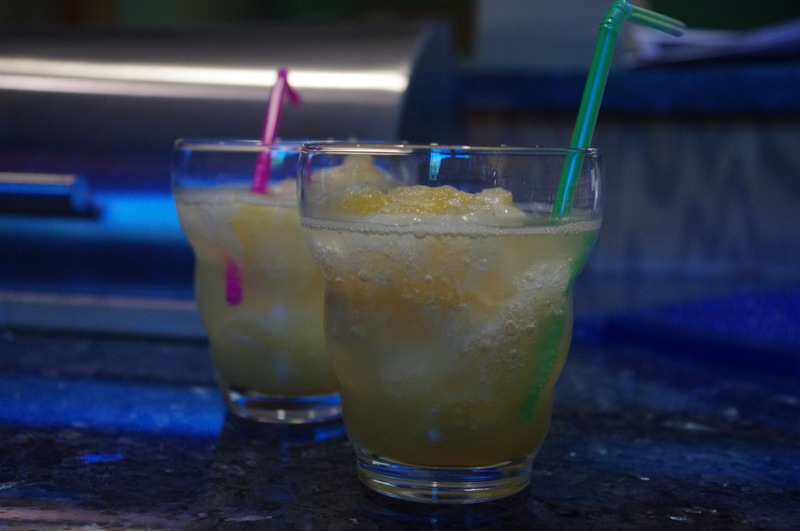 It’s a sweet, slushy, fun drink, perfect for a hot summer evening. I couldn’t remember where I got the recipe from and my friend said that her mom used to make it. Mystery solved. She also said that her mom served it with cream soda. I’ve always used 7-Up, but you can branch out and try another flavor. In a large saucepan, heat 3 1/2 cups water. Add sugar and stir until dissolved. Remove from heat and set aside. Heat the remaining 1 cup water and steep the tea bags for a few minutes. Stir tea into saucepan of sugar and water. Add lemonade concentrate, orange juice concentrate, and brandy. Stir well. Freeze overnight. To serve, scoop slush into a large glass and fill glass with 7-Up or other soda. Add a straw for stirring and sipping! Notes: This is scoopable straight out of the freezer. 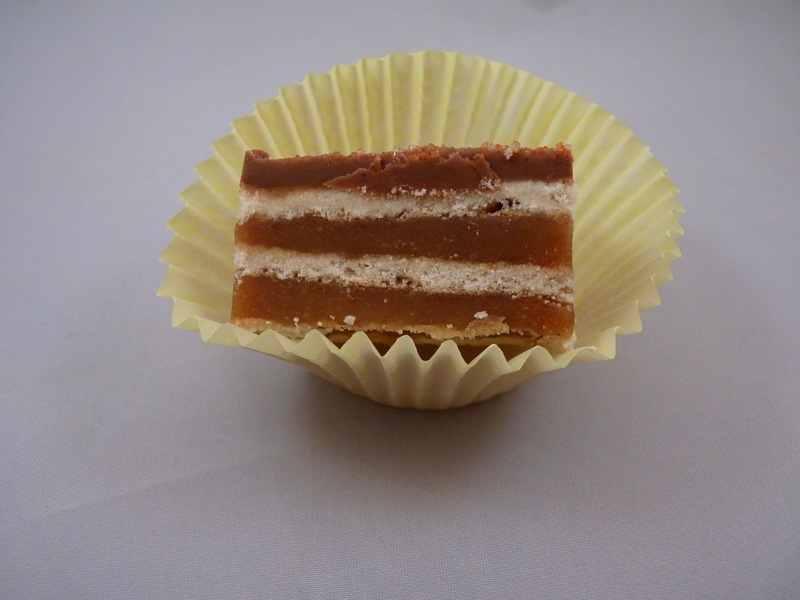 However, it will be easier to scoop if you freeze it in a flat container or divide it into a few smaller containers. Lemonade and orange juice concentrates usually come in 12 oz containers. Re-freeze the other half of the concentrates for another batch of Brandy Slush! Each month, the My Kitchen, My World group cooks dishes from a different country. 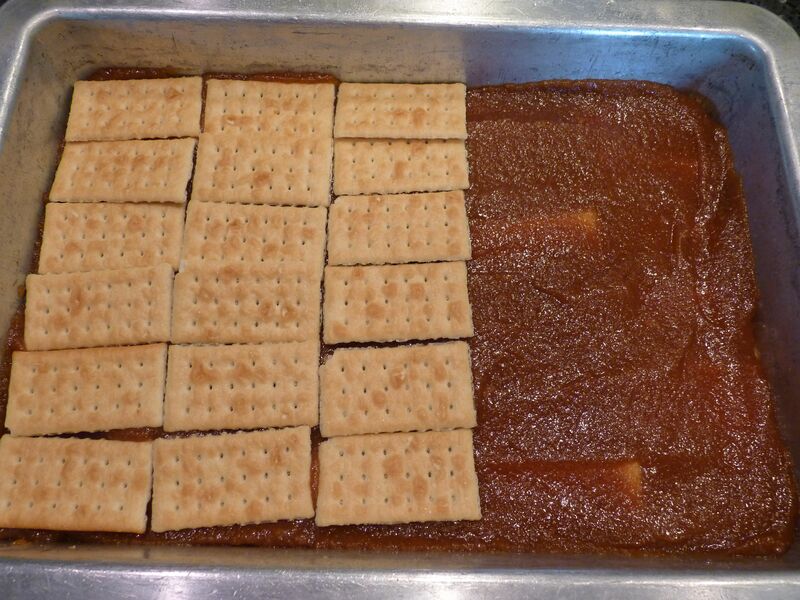 For July, in honor of Independence Day, Andrea of Nummy Kitchen selected the USA. Melting pot that this country is, this was an interesting one to think about. I settled on peanut butter cookies, and none other than the recipe that I grew up with. Somewhere along the line in my years of making these, I started adding one of America’s favorite candies: M&Ms. Chocolate chips are a good addition too, but there’s something about that crunchy, colorful candy coating along with this thin, crunchy, peanut buttery cookie. 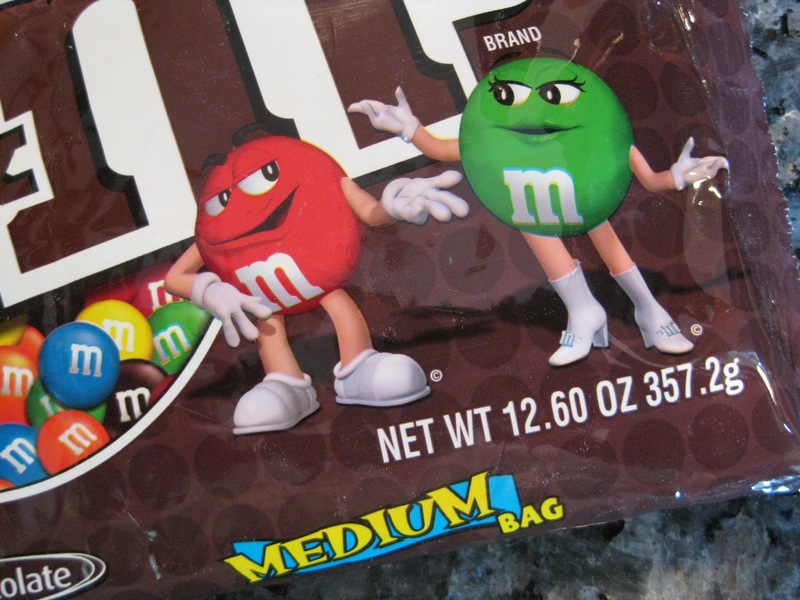 But I have to say, every time I open a bag of M&Ms, I’m surprised and dismayed by the blue ones. Yes, I know they’ve been around for quite a while, and I’m sure some youngsters don’t know any different, but I haven’t bonded with them. I’m all about the different flavors of M&Ms though – have you tried the pretzel ones yet? If you like sweet and salty, give them a try! Back to the cookies, when I was little, we mixed cookies by hand with a wooden spoon. I used my stand mixer to make these, but I did use my favorite measuring cup, which I’ve had forever. 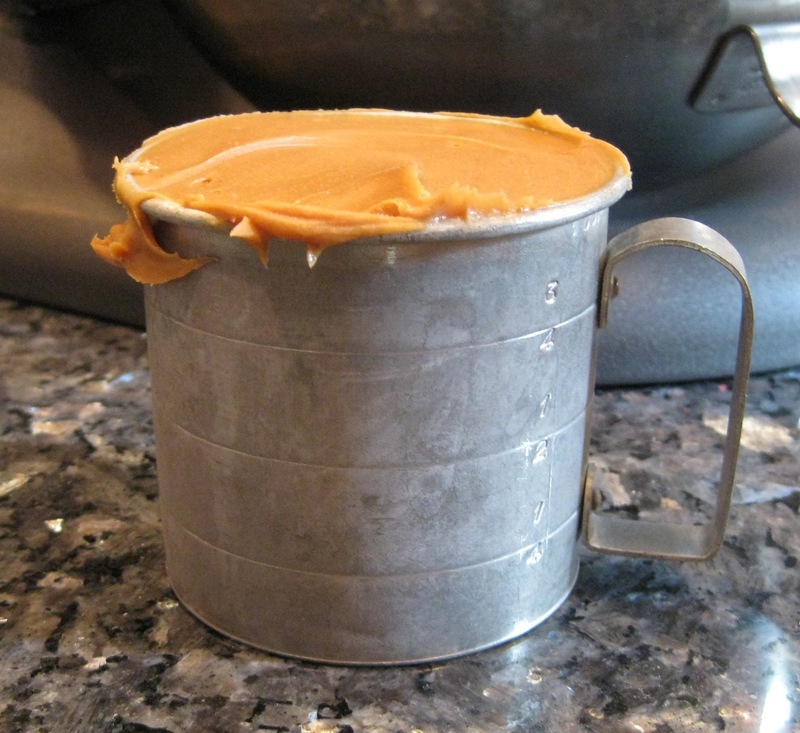 I always use Skippy peanut butter, sometimes creamy, sometimes super chunk. I added a little salt, which wasn’t part of the original recipe. I wonder if they don’t need it because of the salt in the peanut butter, but it didn’t seem to hurt. I’m sure there will be quite a melting pot of recipes this month, so be sure to check out what the others have made. There will be a roundup post on My Kitchen, My World on the last day of the month. Sift together baking soda, baking powder, salt, and flour. Cream butter until light and fluffy. Add brown and granulated sugar and mix until combined. Beat in eggs and then peanut butter. When thoroughly combined, add sifted dry ingredients and mix until combined. Gently stir in 1 cup of M&Ms. Form into walnut-sized balls and flatten with a fork, making a criss-cross pattern. Leave at least 2 inches of space between the flattened cookies. 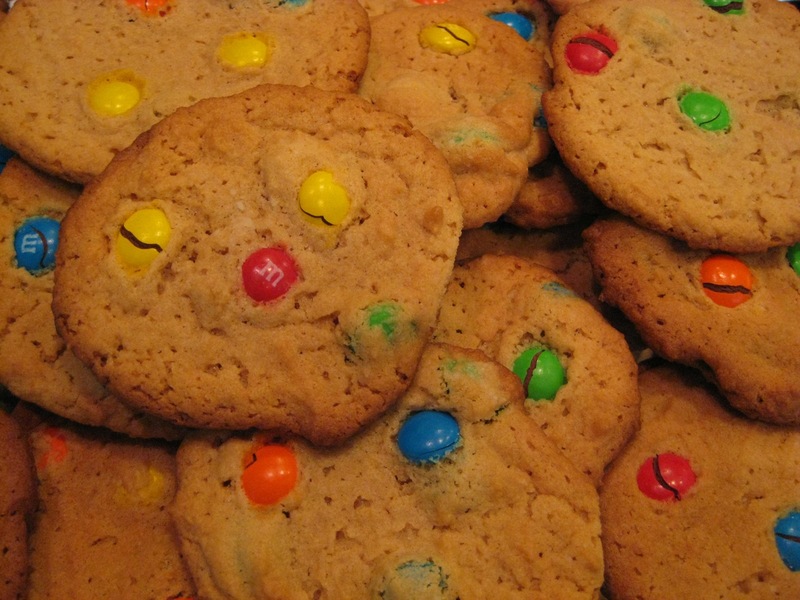 Press a few M&Ms onto the top of each cookie (add as many as needed, depending on how many are already mixed into the cookie). If you do it right, you’ll have a handful left over for snacking! Bake at 375º F approximately 10 minutes, rotating the cookie sheets halfway through baking. 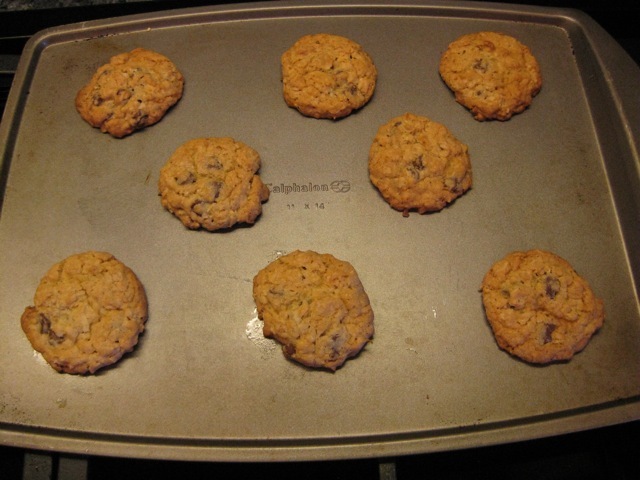 Cookies should be lightly browned. These are a crisp cookie, and the browner they get, the crisper they are. I brought these cookies to work today as an “I’m baaaaaaack” treat. After a nice chunk of time off over the holidays, I am now working as a consultant for a former employer. When I worked there before, I brought these cookies in for a treat many, many times. So when I decided to bake some treats for work, I knew these would be the thing to bring. When my boss asked what I brought, I told her that they were my “old cookies.” Way to make them sound appealing! Can you tell that I’m not in sales? Thankfully, these sell themselves. 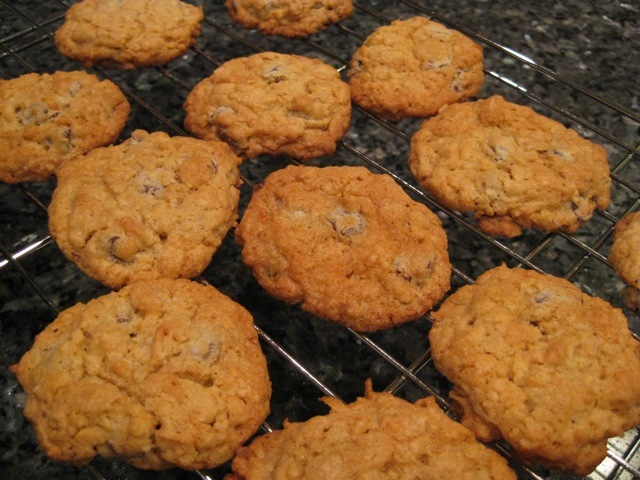 Chocolate chips, oatmeal, and coconut in a crisp cookie. Yum! I’ve been making these since I was a child, and they are now my standby cookie. I’ve seen numerous recipes for cookies called Ranger Cookies. This is my version. Sounds better than Old Cookies, doesn’t it? I used a #70 cookie scoop, but you can make them larger or smaller. 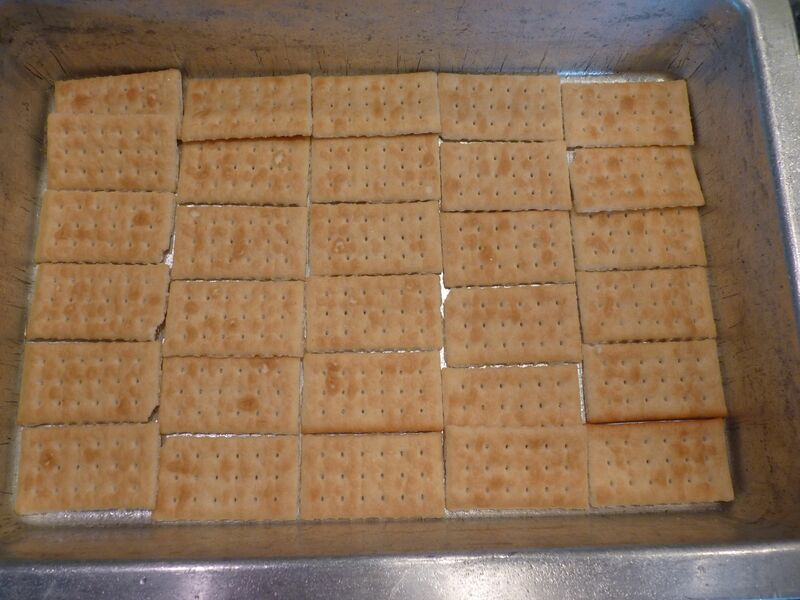 They do need some space to spread out as they bake. I’m not good at estimating distance, so here are photos of the cookies before and after baking. This is a decidedly unfussy recipe. Back in the old days, I mixed these by hand with a wooden spoon, I’m sure I didn’t use unsalted butter, and I didn’t know what parchment paper was. Now I use unsalted butter because that’s what I have on hand, and I mix in a stand mixer. Although I often use parchment for baking, I don’t use it for these cookies. I always use Nestle Toll House chocolate chips. The original recipe calls for Rice Krispies and raisins too, but over the years, this has become the preferred recipe and it’s how I always make them. If you’re a dough eater, watch out; it’s irresistible. In a large mixing bowl, cream butter, granulated sugar, and brown sugar. Add eggs and vanilla and mix well. In another bowl, sift together flour, baking soda, baking powder, and salt. Stir into creamed mixture. Add oats, coconut, and chocolate chips. If using a stand mixer, add the chips last and mix gently so they don’t get chopped up. 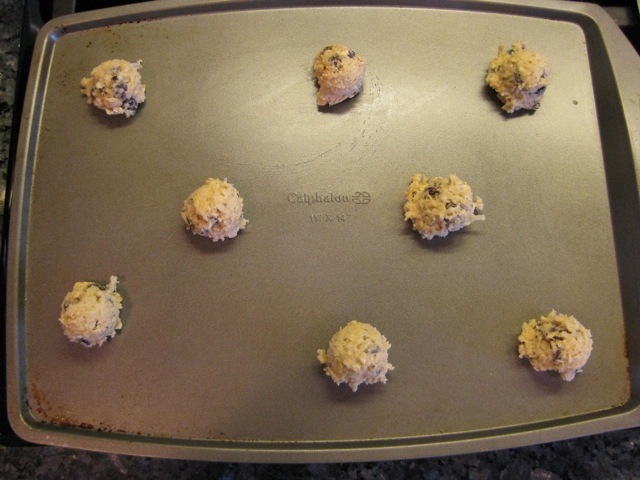 Drop by tablespoons onto a cookie sheet. Bake at 350° 8-10 minutes or until lightly browned. Don’t let them get too brown or they’ll be super-crispy. Let them cool on the cookie sheet for a minute or two and then transfer to a wire rack. Makes about 6 dozen 3-inch cookies. I’ve been making Peanut Butter Caramel Corn for quite a few years. It’s easy to make and very addictive! The peanut butter is a nice twist on the classic caramel corn flavor. I made a batch and gave some away to friends over the holidays. One of them is a long time fan of this and was very happy when I handed him a bag. My other friend hadn’t had it before, but she took it home with her to North Carolina and served it at a party and reported back that her guests loved it. The rest of the batch which was sitting in my kitchen also disappeared quickly! I gave this recipe to Michele at Veggie Num Nums and she made it too. 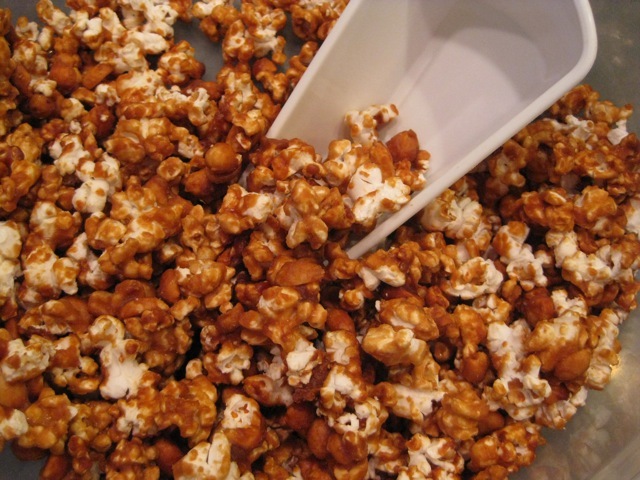 Check out her post to see what she thought of it, and to see the other great-looking caramel corn she made! You can use your favorite method of making popcorn: stove, microwave, air popper. You just want some plain popcorn to use as a base. I’ve been using a Presto Power Pop for years and I love it. It pops corn in the microwave without oil, plus it has Orville Redenbacher’s autograph on the lid! (No extra charge for that!) There is a cardboard cup that sits in the bottom of the popper. Each cup can be used many times, so it’s not expensive to keep the popper going. The recipe came from a library book, but it’s been so many years that I don’t know the name of the book anymore, so unfortunately I can’t give it proper credit. The original recipe name is Peanut Butter Candied Corn. Preheat oven to 250º F. Combine popcorn and peanuts in a large roasting pan (I divide between 2 9 x 13″ pans, sprayed with non-stick spray). In a large saucepan, combine brown sugar, corn syrup, butter, and salt over medium heat. Stirring constantly, bring to a boil; boil 1 minute. Remove from heat. Add peanut butter and vanilla; stir until smooth. Strin in baking soda (mixture will foam). Pour over popcorn mixture; stir until well coated. Bake 1 hour, stirring every 15 minutes. Spread on wax paper, parchment, a silicone mat, or lightly greased foil to cool. Store in an airtight container. You are currently browsing the archives for the Jill's Signature Recipes category.